Please use the form below to contact any of our experienced Private Investigators. Hodson P.I. Investigations has two locations. Our Orange County office is located at the penthouse floor of 1440 North Harbor Blvd. in suite #900 in the city of Fullerton, Orange County, California. Our Riverside / San Diego offices are located in Murrieta, CA. However, our location is relative; we conduct investigations all over the world. 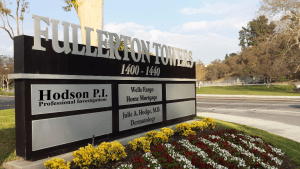 Our Private Investigations firm was founded in Fullerton, CA in 2003. Due to the confidentiality and demand for our service, we do not take walk-in clients. To request a consultation please use the contact form below. Please contact investigations firm today or request a quote. Click Here to request a quote. Please locate our contact form below to contact a private investigator. Once you submit your contact information to Hodson P.I. Investigations a licensed and qualified private investigator will contact you with in 24 hours. For faster response please call our private investigators at 714-646-4545. To receive a quote on a potential investigation please go to our quote page. Hodson P.I., LLC, California licensed private investigator number 23796. Laws concerning investigations vary state by state. Please check your local laws before conducting any investigation. Hodson P.I., LLC, DBA Hodson and Associates, dba Hodson, P.I., Justin D. Hodson is not an attorney and does not provide legal advice.